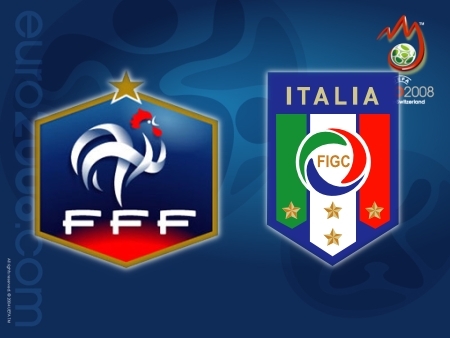 France 0-2 Italy. Ladies & gentlemen, this is how you mix a “Blue Lagoon”: 1 oz Vodka (Pirlo), 1 oz Blue Curaçao (De Rossi), cherry (Buffon’s save on Benzema), 1 part Lemonade. Don’t have any lemonade? We’ll settle for some Oranje zest (Huntelaar and Van Persie). The Azzurri’s Euro 2008 adventure continues to the Quarter-Finals. With rage. That of Andrea Pirlo, master sniper from the spot, and Daniele De Rossi, serving a thundering set-piece drive into the net. It would be hasty to say “the World Champions are back”, but they’re on the right track. Today, the team looked in better shape, more motivated, more concentrated. And luck, the factor the Azzurri were so cruelly lacking until now, finally lent a helping hand to Roberto Donadoni & Co. France’s match went from bad (Franck Ribery’s injury in the 10th) to worse (Eric Abidal’s foul on Luca Toni inside the box, and resulting red card) in less than 15 minutes, and Thierry Henry’s deflection on Daniele De Rossi’s 62nd-minute free-kick was just the ultimate insult for Raymond Domenech, who will undoubtedly have to step down following his team’s elimination. Tactically, Italian coach Roberto Donadoni decided to make two changes for today’s match: full confidence in Gennaro Gattuso and Antonio Cassano. Italy’s 4-3-2-1 formation looked a lot like AC Milan’s Xmas tree formation, with Talentino and Simone Perrotta providing support behind Luca Toni. In midfield, except for Daniele De Rossi this was vintage Rossoneri set-up: Gattuso and Pirlo providing the core of play for the Azzurri (the former to win the ball back, the latter to distribute it forward). As for the back line, no doubts there: Zambrotta and Grosso on the wings, Panucci & Chiellini in the middle. On the other end, France’s Raymond Domenech made a bold move by leaving veteran center-back (and captain) Lilian Thuram on the bench. Some may say Thuram’s past his expiration date, but his replacement today (Eric Abidal) would later prove playing center-back’s not his thing. Other changes made by Les Bleus included François Clerc replacing Sagnol as right-back and Karim Benzema subbing in for Florent Malouda. France started the match with rage. Concentrated. Motivated. The Azzurri weren’t inferior to the task. Italy’s passing experts (Pirlo, Cassano, Zambrotta, Grosso) immediately got to work, and it took them only 4 minutes to set up Luca Toni in the clear (after a missed touch by Abidal), precisely through a deep pass of the Lyon wing-back. LucaBomber however shot wide, adding to his unfortunate series of missed chances at Euro 2008 (a list which would only get longer as the match progressed). In minute 8, the first turning point of match: Franck Ribery went down while trying to challenge Zambrotta off the ball (getting entangled in the Italian wing-back’s legs). Knee injury and game over for Franck, enter Samir Nasri. 30% of France’s penetration power had just been stretchered off, something which the Azzurri certainly weren’t lacking today. Christian Panucci tried to put his golden noggin to work (minute 11), finding only Makelele to deny him the joy of his second at Euro 2008. 10 minutes later a good service by Pirlo was narrowly missed by Perrotta inside the box. The Azzurri were fighting. In minute 25, the second (and decisive) turning point: a great ball by Pirlo found Luca Toni through on goal inside the box. Luca hooked the ball and was ready for the finish, until Eric Abidal upended him from behind sending the Bayern giant flying. 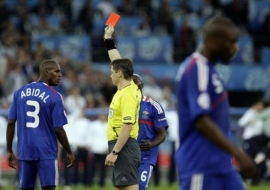 Penalty and red card for the Barça full-back, every France fan regretting Thuram. From the spot Andrea Pirlo made no mistakes, and sent it flying into the top left corner. 1-0 Italy. Counter-measures for Domenech had to include patching up the gaping defensive hole, so Samir Nasri promptly left his place (his matching lasting only 15 minutes) to Jean-Alain Boumsong. That effectively left Henry and Benzema rather lonely up front, with Sydney Govou as the only real solution of passing support. Not enough. The Azzurri were just having a field day meanwhile: in minute 27, Daniele De Rossi grazed the crossbar, one minute later a Cassano cross from the right found Toni inside the box, connecting with a stylish heel/bicyle flick (not sure what it was) narrowly wide of the post. Then once again Toni (exploiting a Pirlo pass) was through on goal, and once again… missed the target. Not Luca’s day obviously. France reacted with French pride, keeping the Italian defense on their toes. A good run by Thierry Henry sent the Barça man through on the right, but his diagonal shot was inches wide of Buffon’s left post. A warning for Giorgio Chiellini, his marker on the occasion. Meanwhile, De Rossi and Gattuso were operating as the “Azzurri lions of midfield”, the latter living up to his “Ringhio” pitbull reputation and the Roma man acting almost as an added stopper (with the occasional runs forward). On one of these runs, Italy obtained a good free-kick on the edge of the box, which Fabio Grosso carefully aimed at the bottom-left corner of Gregory Coupet. France’s keeper got a hand to it, deflecting the shot onto the post. After 45 minutes, France 0-1 Italy and Romania 0-0 Netherlands: the Azzurri had their ticket to the Quarter-finals, but anything could change. In the second half, France was back with a vengeance: first Karim Benzema exploited a good right-wing cross and connected with a slamming a howitzer wide, then Thierry Henry gave shivers to Azzurri supporters with a low shot to the ground (easily saved by Buffon). Italy was suffering in midfield (overpowered by the physical presence of Makelele and Govou) and fear was slowly re-surfacing. Time for some changes: out Andrea Pirlo (accumulating fatigue over the past 3 games), enter Massimo Ambrosini (another defensive midfielder). Then suddenly in minute 56, some more good news arrived for the Azzurri: Netherlands had just opened the score vs. Romania through Klaas-Jan Huntelaar! Even better news would arrive just 5 minutes later, as Daniele De Rossi went for power on a Cassano-obtained free-kick, finding Henry’s boot on the way to goal. Fooled by his teammate’s deflection, Coupet was sent the wrong way, powerless. 2-0 Italy! Cue some more changes for Donadoni: out Perrotta, enter Mauro Camoranesi. Domenech replied with Nicolas Anelka on for Govou. Not much of a change for France, who were more or less keeping afloat thanks to the creativity of Karim Benzema. His curling right-footed effort in minute 73 was destined for the top corner, but Gigi Buffon once again proved why he is the best keeper around. Then came the news of Holland’s 2-0 goal, and everyone wearing Azzurro in Zurich went nuts. Unpack your bags guys, we are staying in Vienna! FRANCE (4-4-2): Coupet – Clerc, Gallas, Abidal, Evra – Govou (66’ Anelka), Toulalan, Makelele, Ribery (10’ Nasri, 26’ Boumsong) – Benzema, Henry. (bench: Mandanda, Frey, Malouda, Vieira, Thuram, Squillaci, Sagnol, A.Diarra, Gomis). Coach: Domenech. This entry was posted on Tuesday, June 17th, 2008 at 6:56 pm	and is filed under Azzurri, Euro 2008. You can follow any responses to this entry through the RSS 2.0 feed. Both comments and pings are currently closed. Heh. That’s assuming you guys beat Sweden/Russia. I watch all of Italy’s international matches and I think they are a fantastic team. However, they are a team with a high variance of play. You can put the same team out one day and they will get crushed by the Nedtherlands and the next day they could beat them. Italy on their best game is world class but they can sometimes fall into a lowly form which could come back to bite them when it is one loss and your out. Undoubtebly they could win the tournament, but my bet is they lose to the Portugal in the final. I hope Italy use this to improve in the quarters because at this point they’re not strong enough to see off Spain. Philippe Mexès must have watched Abidal’s and Thuram’s performances and wonder what he’s done to upset Domenech. Well there was always going to be only one winnier in the matcha nd that was Italy. France had not been playing well at all (not that Italy were playing well but they were better). The only good thing about France was Ribery. Once he went off France never really posed too much of a threat on the Italian defence. The moment Abidal got sent off the game awas already over. Italy have not been great in the tourney only because of thier finishing. They have had loads of chances but messed up almost all of them. Toni has missed about a million chances. Should have scored atleast 3 rto 4 goals by now in the euro. Chris is rubbing off on you, huh Daryl? Mexès has no fault except that of playing in Italy, that’s a good enough reason for RayRay DumbDumb to leave him at home. And yeah Pirlo and Gattuso’s absence will surely be a factor, but on the upside we might finally see Aquilani get some real playing time.